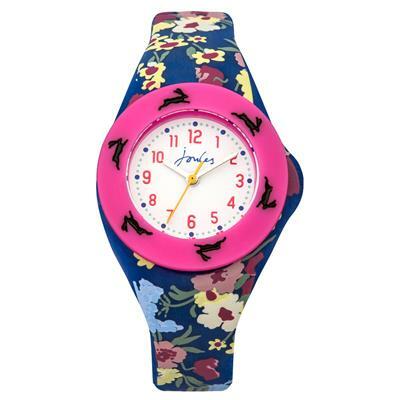 These fun and fashionable watches from the Joules range are the perfect way to help your little ones tell the time. Made from wipe clean silicone in bright colours and designs and packaged in a fun egg shape box which can be used as a money box, they're the perfect present for your little relative. This interchangeable design features a cute floral design which can be changed for a solid pink strap. Featuring the Joules bunny design on the bezel and joules logo to the dial with simple numbers and three hands to tell the time.